I recently went back-to-school shopping with my kids, who will both be in Jr. High this year. Hold me. Don’t get me wrong, I actually love the ages they are right now. They are funny, and interesting, and opinionated and smart, and finally laugh at my jokes – well, not all of them but at least a few. Also, I can leave them home for short periods of time. I don’t have to drag two kids around with me everywhere I go this summer. Freedom! Except when I take them back-to-school shopping. For that, they need to come along to offer their opinions – and boy, they have no shortage of those. I remember fondly the days of grade school. And while those days were challenging for many reasons, I appreciate that when shopping, I was free to choose and purchase any items that I wanted. They pretty much went with the flow. Now, it’s all changed. Back-to-school shopping has become an endless series of negotiations. This endless series of negotiations lasted through pencils (they want the mechanical ones with the plastic outsides instead of regular biodegradable wood ones), pens (the giant pack of colored ones we don’t really need), binders (do those have PVC in them or not? I can’t tell). So right there, in the middle of Target, I had an I-really-don’t-know-what-I’m-doing mom moment. Balancing on the one hand, wanting to protect my kids from chemicals and do the best I can to raise them in a healthy environment. On the other hand, concern about my son, off to a new school where very few of his friends are going – off to the world of Jr. High, and changing for P.E. and tall boys who look closer to men than to anything resembling my son. Ultimately I said “Yes, let’s pick out some regular deodorant to put in your locker.” I cringed and he smiled. At the end of our shopping trip, Emma said “Mom, we’ll load everything on the check-out counter. Don’t worry. We got this.” And Ellis smiled. And I got suspicious. As I glanced over, I saw that they had conspired to hide a big bottle of Dr. Pepper under our items when I wasn’t looking. I picked it up and handed it right back to them. They knew it wasn’t going to happen. But they got a good laugh out of it and so did I. So I admit, sometimes I’m not a very good “green mom”. I let them get the turquoise binder, and the regular deodorant, and the giant container of colored pens that they really don’t need. But I do know that I am a good mom – and Jr. High will require some balance and compromise on both sides. Peer pressure will be powerful, but I hope that I’ve said things enough times in enough different ways, that they will remember my words later, in the key moments when they need to make good decisions. Well, that and I made them put back the Dr. Pepper. Posted in Kids and tagged back to school, green, junior high, mom, personal care, safe, school, shopping, supplies. Bookmark the permalink. One of my kids is a grazer. He’s on a growth spurt right now and wants to snack all day long. After finding empty popcorn and Pirate’s Booty bags around the house yesterday, I decided to take some action to ensure better, healthier snacking this summer. I noticed that if I buy the organic pre-cut apples, my kids will grab those when they are hungry first. I usually avoid the pre-packaged foods because of the waste, but at Costco yesterday these were the only organic apples they had, so I broke down and bought them. Immediately after getting home, both kids grabbed one and started snacking. That’s when I had an idea. This morning, I spent 15 minutes washing fruit and vegetables – in a one part vinegar to ten parts water solution to prohibit mold growth and prolong shelf life of fruit and veggies. The vinegar evaporates and leaves no taste on your produce so don’t worry. 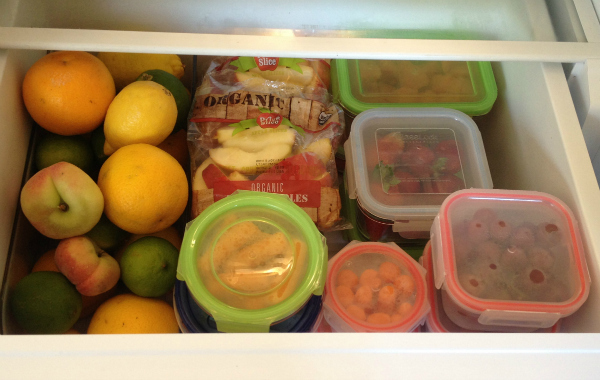 Then, I divided everything into individual servings and loaded up the fruit and veggie drawer. Making fruit and veggies as easy as grabbing a bag of chips. Here’s hoping for healthier snacking this summer. Posted in Food and Recipes, Kids and tagged fruit, healthy, kids, organic, snacks, summer, vegetables, veggies, Wordless Wednesday. Bookmark the permalink.